SAVAGE the self effacing project SAVAGE , SAVAGER , SAVAGEST , SAVAGE AS NAUSEAM, SAVAGED INFINITUM The work in this show does not easily offer answers, entrances or exits. There is nothing more than what you see in our work as the profound desire to follow a path. The path of dreaming backwards, back to the state of self-effacing. We have tried to remove the weight from the structure of stories and even from the language itself. The actual work is not what our work is but, rather, what it becomes... what is in the process of becoming. Marco Pho Grassi, a Milanese artist, chose the rhythm of writing to accomplish a trance-similar level, where strokes become self taught live forms. In his search for true forms he approaches his work not like the construction of a building, where action is the logical steps forward from the previous one, but, on the contrary, follows the true process of construction, which involves a sort of demolition at the same time. By automatic writing and multiple layers he tends to touch the birth moment of the consciousness. The animalistic instinct and the savage stadium where, uncontrolled, the deepest inside thoughts emerge at the surface. All those `demolitions` create a dangerous space in which time travel develops where he allows us to discover a writing before consciousness. Jaybo Monk, a French artist living in Berlin, is an outcast. His work is not to be found in a mass compatible *freeway* but more in a one-way street walked down against the flow. In his cartography of empty space and remixed genderless bodies, Jaybo tries to find that blank sheet of paper, the one that every child possess, where no explanations and no connections are useful, but just the acceptance of the fact. Places in opposition to all the other ones, which are made to allow the other space’s disappearing, to neutralize them- a non-space, local utopias which children know perfectly: the poetry of watching. It is exactly there, through poems and rescued objects, as well as in his paintings, that he improvises in his self-portraiture, tracing out the journey he’s made, by the search of his own personal Big-Bang... his own Savage state, the time before education. The Savage state is the base of creativity: its above, its beyond and further. And here again theories just describe our own ignorance. 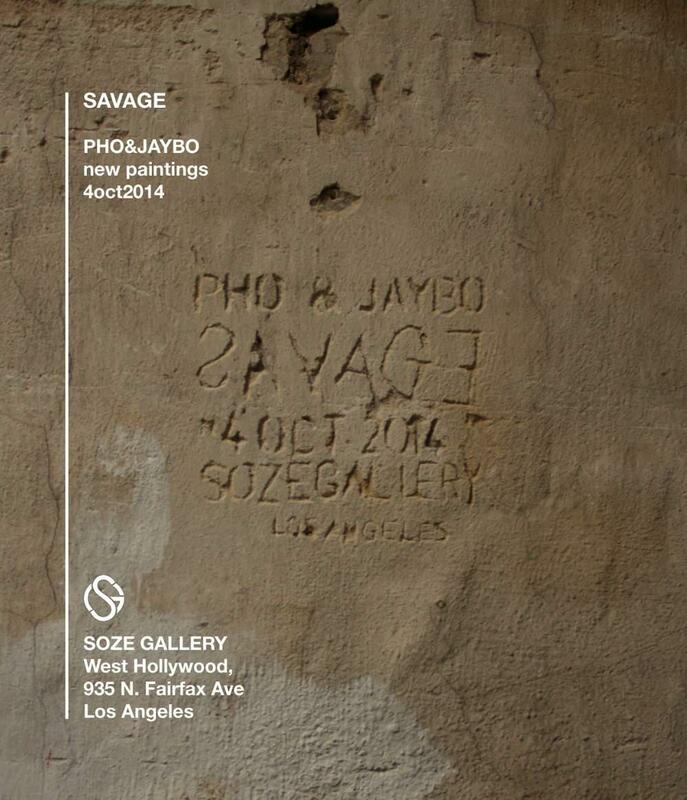 About Soze Gallery: Soze Gallery is a contemporary art gallery in West Hollywood that represents and exhibits top Contemporary artists in Street Art, Graffiti and other genres, while also introducing up and coming talent to the art scene. Founded and directed by Toowee Kao, the gallery has recently opened its gorgeous new location in the heart of West Hollywood after being a longtime anchor in the developing Downtown Arts District.